Grow, collect and sell food! When a hurricane ravages a tropical farm, the people there issue a challenge to restore their once beautiful getaway. Beginning with a small patch of land, some tools and a few seeds, you must turn this steamy wasteland into a fertile homestead bursting with fruits, vegetables and livestock! 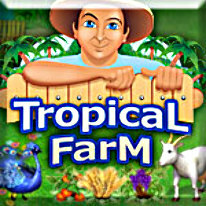 The harvest is ripe with fun as you grow, collect and sell food, pointing and clicking in a race against the clock to complete tasks on your Tropical Farm!